Few people have been entertained by geiko(it's called geisha in Kanto region) or maiko(apprentice geiko) at ochaya, which literally means a tea house but it is actually a traditional restaurant, in Kyoto. Although some ochaya provide an opportunity for ordinary people to be entertained at ochaya, most ochaya are like an exclusive club and anyone needs an introduction from a club member to gain admittance into them. However, we have an opportunity to see many geiko and maiko once a year. It's a spring dance performance called MIYAKO ODORI, which is also known as the Cherry Dance and features all the geiko and maiko in Gion, Kyoto. It started after the capital was moved to Tokyo to liven up Kyoto. It's being held in Gion from April 1st to the 30th. Their performances were given for an hour four times a day and the admission is between 4,000 and 2,000 yen. You can make a reservation by phone or fax for reservations. The official site of MIYAKO ODORI presents information in English and Japanese. "MAIKOSAN" designed by Katsumi Yumioka. An apprentice geisha is called hangyoku(半玉) in Kanto region, but maiko(舞妓) and hangyoku differ from each other in appearance and many ways. Similarly, geiko(芸妓) and geisha(芸者) are different. Only maiko leaves a trail of obi(sash). Katsumi Yumioka, Colors of Japanese Spirits (Tokyo:NIHON VOGUE-SHA.Co,Ltd.,2005),P.44. Maiko wear a hair ornament called hana kanzashi(花簪) in her hair. The ornament is created by a technique known as tsumami(つまみ). 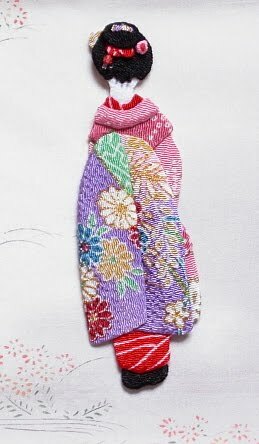 A square of silk is repeated twice to be fold in half diagonally, is shaped into a petal and is attached to backings on the base of kanzashi. Maiko and hangyoku wear hana kanzashi in their hairs, but geiko and geisha don't it. Girls used to wear it at the Shichi-go-san festival, which is the event to celebrate children's growth and pray for their future good health. Maiko wear different hana kanzashi every month. Its motif is associated with each month such as cherry blossoms in April, wisteria or iris in May. an original work using tsumami. In rivalry with the Miyako Odori, geisha in Shimbashi of Tokyo started the dance performance called the Azuma Odori(東をどり) which is being held in The Shinbashi Enbujō (新橋演舞場) from April 26th to the 29th. Their performances were given for an hour and a half three times a day and the admission is between 7,500 and 2,000 yen. you can buy its ticket via the Internet or by phone, but advance tickets are sold out this year. This is a baked confection topped with pieces of walnuts and was given out as a souvenir when the Azuma Odori was premiered.